After spending the period between Christmas and New Year at home last year, Kelly and I decided this year to do a camping trip to a bunch of national parks that we have not previously visited. 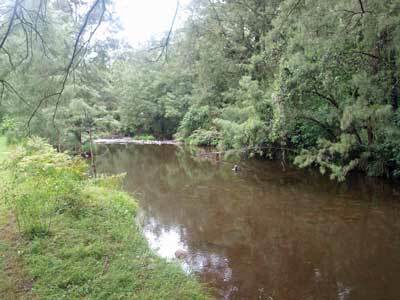 All the parks are located between the northern side of the Hunter Valley and a line west of Port Macquarie. After a bit of planning, we decide to visit Woko National Park and then move onto to Mummel Gulf National Park before heading to Werrikimbe and Oxley Wild Rivers National Parks and then finstally Coolah Tops National Park. We plan to be away for seven nights. Later, we decide to also visit Nowendoc National Park. Our fellow dive club members, Ron and Donna, who also live at Kirrawee, decide to also come on the trip. 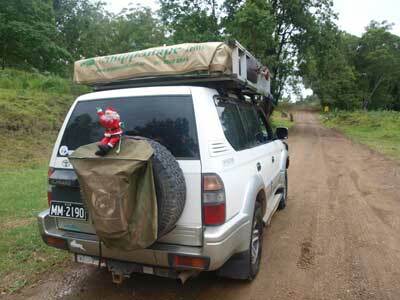 They have a Toyota Prado 120 (2008) with a roof top tent. The following is the story of the short holiday. 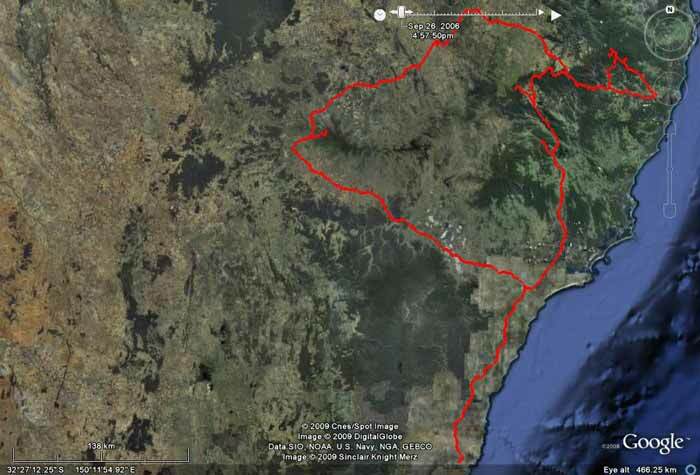 A map of our trip as recorded by our GPS and overlaid on GoogleEarth. Sydney is bottom of the red line and we travelled in an anti-clockwise direction around each of the two loops. 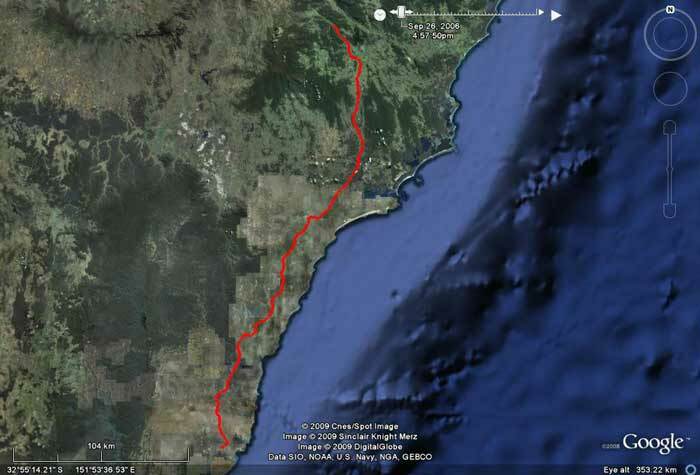 Wauchope is the right of the smaller loop and Coolah Tops National Park is at the end of the small line at the far left. After a couple of months of very dry weather (we have had less than 50 mm of rain in November and December), it starts to rain on Christmas Day about lunch time. Typical, it rains a lot when we go on camping trips. Kelly says that she should hire herself out to farmers in drought areas as a rainmaker! Anyway, this rain is being caused by the remains of a tropical cyclone, Lawrence, which moved from the Indian Ocean over the Western Australian coastline and has headed into the centre of Australia. It stopped being a cyclone soon after it crossed the coast but now has formed into a tropical depression. It is pulling huge amounts of moisture from the Indian Ocean area (thousands of kilometres away) and depositing it into Central Australia and now eastern Australia. Over the next few weeks, parts of NSW will be flooded by the rain that it brings to the drought affected outback. Despite the forecasts of rain (which is supposed to stop tomorrow), we head off on our trip. After originally planning to leave at 7 am, Kelly decides that after some reports of how bad the traffic can be on the F3 Sydney-Newcastle Freeway/Pacific Highway on Boxing Day (today), we should leave earlier at 6 am. Ron and Donna decide to leave at the original time. As it turns out, we linger in bed and eventually leave at 6:50 am. We have a very good run across Sydney from our home at Kirrawee (in Sutherland Shire on the southern edge of the City) to the start of the F3 at Wahroonga (on the northern edge of the city) and we are there in about 50 minutes. It has been lightly raining the whole way. Once on the freeway, the traffic is not too bad, about the same as a weekday outside peak hours. We make very good time and arrive at Hexham at 9:10 am. My sister Janelle and her husband Karl are heading to Macksville, much further north than we are planning to go. They have stopped for breakfast at Maccas at Raymond Terrace and they tell us that they have just left there and are now only a few minutes ahead of us. Our plan is to stop for morning tea at the 12 Mile Rest Area which is just before Karuah. We get there at 9:30 am and find a Driver Reviver open. We have a free cup of tea and some biscuits from the Lions Club caravan. We speak to Ron and find that he is about 20 minutes behind us. At 9:50 am we are back on the road and a very short distance from the rest area take Bucketts Way towards Gloucester. It is still drizzling as we arrive in Stroud about 10:15 am. I have only been through this small town once (in 1999) and never stopped as we were detouring around a major crash on the Pacific Highway. We decide to stop and have a look around the town. 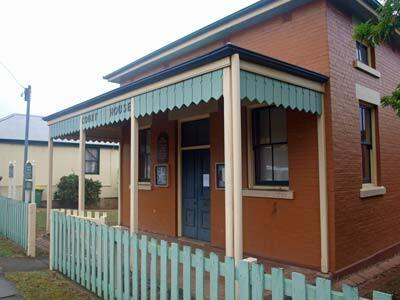 It has some excellent old buildings, including the Court House and Post Office as well as the impressive Stroud House. 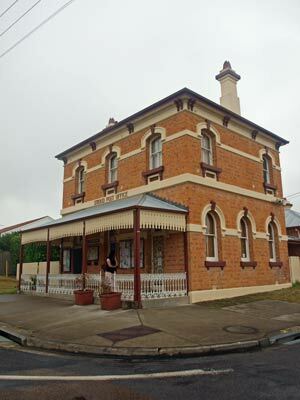 Stroud was established by the Australian Agricultural Company in the early 1800s to service its holdings in the area. We leave Stroud at 10:30 am and about this time Janelle SMSs us and says that they have taken over 35 minutes to travel five kilometres. Glad we are not heading further up the highway. It is still drizzling. Twenty minutes later we pass a very nice picnic area with toilets at Wards River. This would be a good place to stop for morning tea if you were leaving from the northern side of Sydney. At 11:10 am we arrive in Gloucester. The rain ceases as we pull into the picnic area just off the main street (turn left) about two thirds of the way through the CBD. This has a toilet and some nice covered tables. We decide to have another cup of tea while we wait for Ron and Donna to arrive. They arrive not too long later as they did not stop in Stroud. After the cuppa, we head back to a second hand book sale we noticed as we came into town. This is in a small hall at the intersection with Bucketts Way and the signposted way out of town to Walcha/Scone. We wander around the thousands of books, chatting to the old codgers running it. I purchase a couple of books to read over the next week and Kelly also gets a couple as well as a cooking book. We head off at 12:10 pm and go via the Scone Road and then up Thunderbolts Way towards Walcha. The rain is holding off as we turn off the main road onto Curricabark Road the access road to Woko National Park. This follows the Manning River. Here it is very small, compared to where it passes Taree closer to the Pacific Ocean. The river has a lot of water in it and is flowing fast. Along this road we stop and cut a pile of firewood to use later tonight. The camping area is located on the flood detour road which comes off Curricabark Road just before the first causeway across the Manning River. At 1:10 pm we arrive at the camping area (it does not appear to have a specific name) and Kelly cannot believe that there is a fire ban. It has been pouring rain for the past day and she reckons that you could not start a bushfire with a gallon of petrol! Anyway, the camping area is very nice. It is located right next to the Manning River. The first section, however, has a very sloped grassed area which you could not even put a normal tent, let alone park our vehicles with their roof top tents. There are a number of tables and wood barbecues as well as a gas barbecue, inexplicably located at the far end instead of the middle where it would be more accessible. The second section is much better, flat with the best grass you will see in any national park camping area. It has a couple of covered tables (but the overhang is insufficient to make them useable in rain as both the seats and the table are soaked) as well as another gas barbecue. The barbecue has two plates, but only one is working. They are both under a roof and there is a large bench top which is good for preparing meals. There are also wood barbecues in both sections. There are a few other cars here, all of whom we later find out come here every year at this time. The camping area has space for at least 20 cars, but there are only six or seven at the moment. While the rain stopped in Gloucester, it started again as we left town. 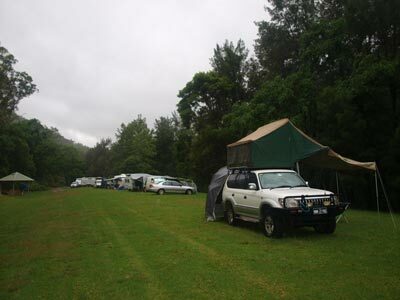 However, as we arrive at the camping area, the rain eases to a very light drizzle. We quickly put up our tents. Kelly has purchased a new attachment to put at the back of the car to give some cover when accessing the rear door (where, of course, all our food and drink is stored). This goes up as well. We then have lunch. Kelly has purchased a jaffle iron so we make some nice toasted sandwiches on our new gas stove. This is one of the cheap ones that uses disposable gas bottles. We have decided to replace our Coleman fuel stoves which even though they are extremely cheap to run (using petrol), they are too prone to blockages and take forever to clean the fuel pipes. Ham and turkey from Christmas lunch with cheese makes some great sandwiches. The rain soon starts again and continues non-stop for the rest of the night. Apart from when it lightens for a few minutes enabling Ron and I to go for a couple of walks around the camping area under an umbrella, all we do for the rest of the day is read our books. Later, a couple of caravans come in and set up camp at the other end of the second section of camping area. Drinks o'clock (5 pm) comes around so we break out a beer and wine and some nibblies. It is really quite relaxing here, having a drink, reading a book and listening to the rain and river. As I mentioned, the camping area is right next to the Manning River. It consists of short rapids and larger pools. If the weather was nice, it would be lovely sitting in the pools. After drinks, Ron and I head off to the barbecues to warm them up for cooking our steaks. The girls prepare the accompaniments and we are soon back with the cooked meats. We have a nice dinner of sirloin, sausages and rice dish. After dinner, we continue reading till about 9 pm and then go to bed where we read a bit more.